Introduced in 2005, the MK-105 retains the authorative lower midrange power Oktava is known for but adds some top end sparkle. The combination of the new capsule, headbasket and transformerless circuit produces a more transparent or hi-fi sound when compared to the classic transformer output coloration and soft top end of the MK-219/319. The large 27.5 mm capsule with precision-drilled backplate holes in conjunction with the headbasket design produces a gentle +4dB rise from 4 kHz to 12 kHz to lend a touch of presence and air to vocal or instrument sources. Inside the headbasket, the capsule is mounted on a conical diffuser designed to reduce standing waves and smooth the capsule / headbasket system frequency response. The MK-105 employs the highly regarded transformerless circuit found in one of the most widely used mics in existence – the MK-102 (over 90,000 in use worldwide) to deliver the alluring sound of direct phantom power applied to a large diaphragm capsule. On-axis - A carefully crafted “double peak” high frequency response provides subtle emphasis of both presence and “air” frequencies while suppressing the sibilance range. 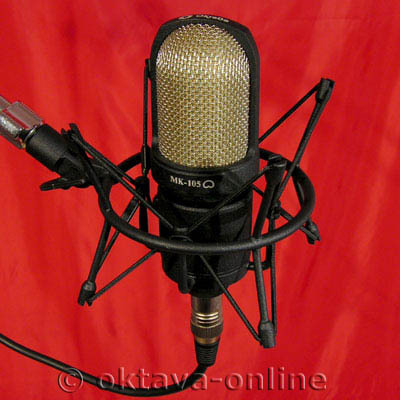 This results in a more modern or “Hi-Fi” sound when compared to the classic midrange-rich 219/319 sound but without the harsh sibilance found in many modern mics. Off-axis - Frequency response at 90 degrees resembles 0 degree response but attenuated a nominal l0dB. 180 degree rejection increases to 16dB below 2kHz but the top end over 4kHz stays just 8-10 dB or so below the on-axis response. This means the MK-105 has a very natural off-axis response out to 90 degrees with a pleasingly bright room ambience. The MK-105 excels where the recordist wants a large diaphragm cardioid mic with a musically useful proximity effect, a sparkling top end free from sibilance and a bright room ambience sound.